Habeas corpus is a remedy of last resort for prisoners. Used by state and federal inmates alike, it is often the final opportunity to challenge the legality of a criminal conviction or sentence. The access to federal court provided by habeas corpus jurisdiction serves as an important check on the government's ability to take away the liberty of a citizen. But Congress has erected many roadblocks that must be navigated by the habeas corpus petitioner. The long odds on habeas relief and its status as a last resort mean that the habeas petitioner must submit a perfect petition the first time. There can be no mistakes, and all grounds for relief must be included. Thankfully, prisoners and their attorneys now have access to the Second Edition of The Habeas Citebook: Ineffective Assistance of Counsel. This indispensible resource provides the practitioner and the pro se litigant with everything they need to perfect their habeas petition and to include all available ineffective assistance of counsel grounds. Written by former prisoner-turned-lawyer Brandon Sample and former staff attorney for the Human Rights Defense Center Alissa Hull, The Habeas Citebook is jam-packed with citations that cover every variety of ineffective assistance of counsel. The citations are organized into 52 topic-driven chapters, so finding the citation you need is a snap. 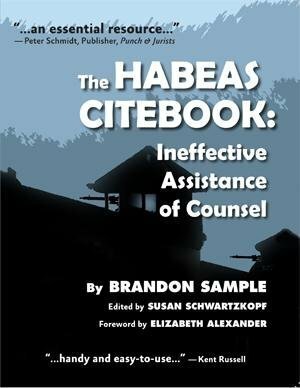 The Habeas Citebook also provides citation-driven guidance on the standards associated with particular types of ineffective assistance of counsel claims. Finding the citation that supports an error made by counsel is quick and easy, and so is finding the citation that describes the necessary standards that must be met in order to make the claim. This ensures that the habeas corpus petition is drafted and pled properly the first time and every time. For the less experienced prisoner, The Habeas Citebook also includes multiple appendices loaded with forms written by attorney David Zuckerman, who practices out of Seattle, Washington. There is no need to reinvent the wheel; the format and layout of a proper habeas corpus petition is right there for reference. The appendices also include other sample filings that may be needed by a habeas petitioner. The Habeas Citebook is one of several excellent resources published by Prison Legal News Publishing. It is a must-have book for anyone who deals in post-conviction litigation, including attorneys and prisoners.